After Whistler Blackcomb, the Mount Washington Alpine Resort on Vancouver Island is the second busiest recreational winter holiday destination in British Columbia. It has an average snowfall of 30ft (9m) that usually lasts from early winter until after Easter. The resort has about 50 marked ski runs, snow tubing, cross country skiing, snowshoeing trails, and a snowboard terrain park. The resort is also set in a spectacular location, looking out across the Strait of Georgia with vistas of the Sunshine Coast and the peaks of the Coast Mountains. 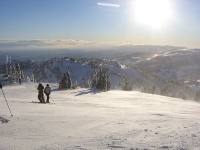 Nearby Comox Valley hosts many of the holiday visitors to Mount Washington in its variety of hotels, motels, and B&Bs that offer special ski packages during winter months. The ski resort is located 20 miles (32km) northwest of Courtenay on Vancouver Island, about three hours drive from Victoria. Mount Washington is one of Canada's best ski resorts in terms of the runs available, with its nearest competitor being Whistler on the mainland. It is known for reliable snowfall, with an average of 30 feet providing a blanket of powder to glide on. The resort has slopes catering for a range of difficulties, varying from gentle beginner runs to challenging black diamonds and professional runs. Shopping in Mount Washington is very limited, with only a few stores at the resort concentrating on general goods and sporting supplies. Those in search of fashion brands and luxury items may be disappointed. There are a few restaurants in Mount Washington, with options including sushi, sandwiches, steaks, burgers, and other mainstream fare. Be sure to try the local coffee from Beavertails, which is renowned. Mount Washington doesn't have much of a nightlife, with only two or three bars to choose from. These venues can get busy on weekends but overall the resort is geared more toward families than young singles looking for a party. Mount Washington is a small resort with no real village, so there is a lack of shopping, restaurant, and nightlife options.